One thing you can’t help but notice is that a couple of the 6-inch scale figures in The Avengers Movie Series by Hasbro are actually molds that had been used for a previous movie line. 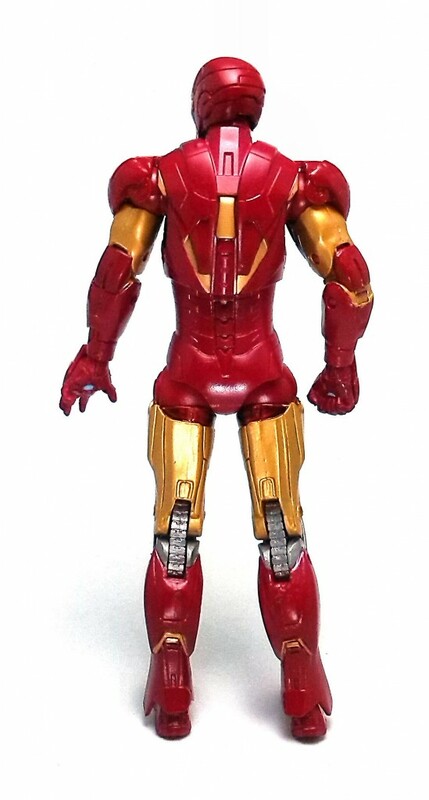 While Thor certainly had the benefit of sporting a new head sculpt, Iron Man is basically the same Mark VI mold that had come out for the Iron Man 2 movie line. This is not a bad thing, necessarily, as the figure is a nicely detailed depiction of that armor, with sharply defined panels and suitably heroic proportions. 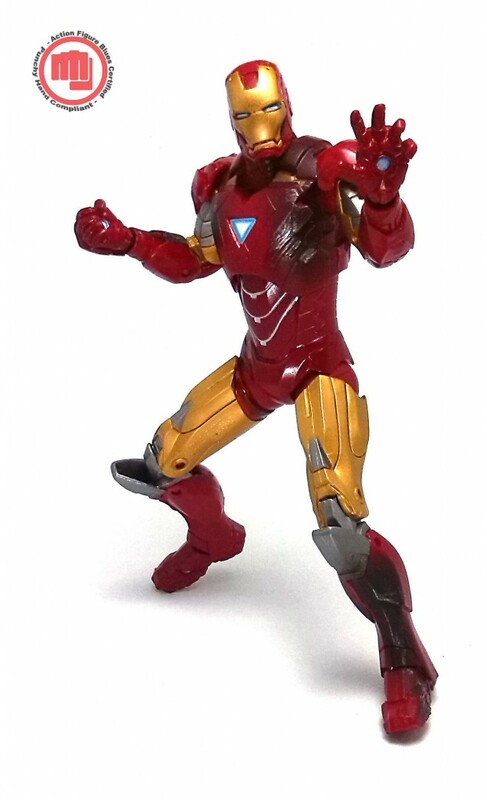 As usual with Hasbro-made Iron Man action figures, the armor design limits slightly the range of movement at the hips, the hands can’t bend upwards and the ankles lack the ability of tilting to the sides for improved stability, but I was expecting all of this, so it is not a big deal. The one thing that makes this figure to stand out is the paintjob, specifically the battle-damaged look. 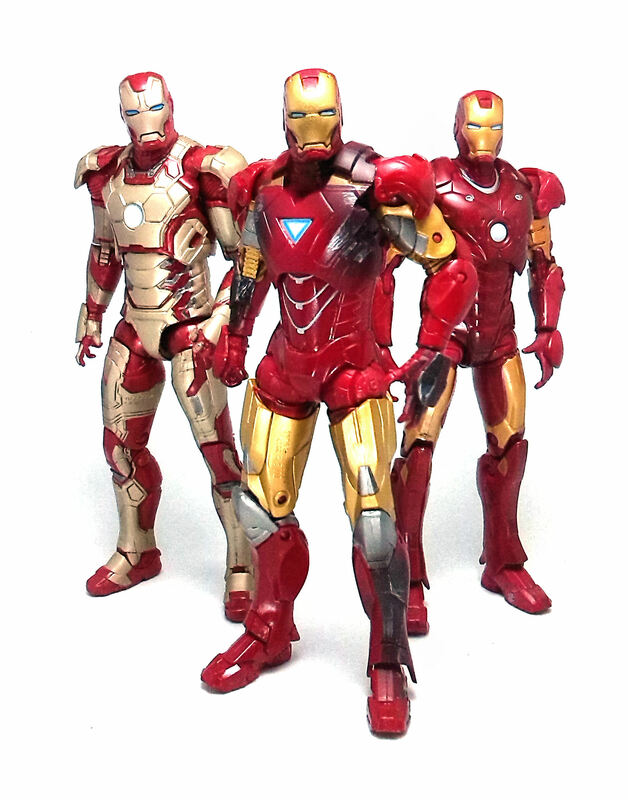 The base paintjob on this Iron Man suit is very neat and clean, with a consistent coverage on both the red and gold sections. Additionally, there are a few extra touches of color in the form of gunmetal silver accents on the armor; while eyes, repulsor ports and chest reactor were painted neatly in blue and white. The battle-damaged parts have carbon scoring simulated by airbrushing black paint over the damaged area and having silver scratches painted right at the simulated impact points. 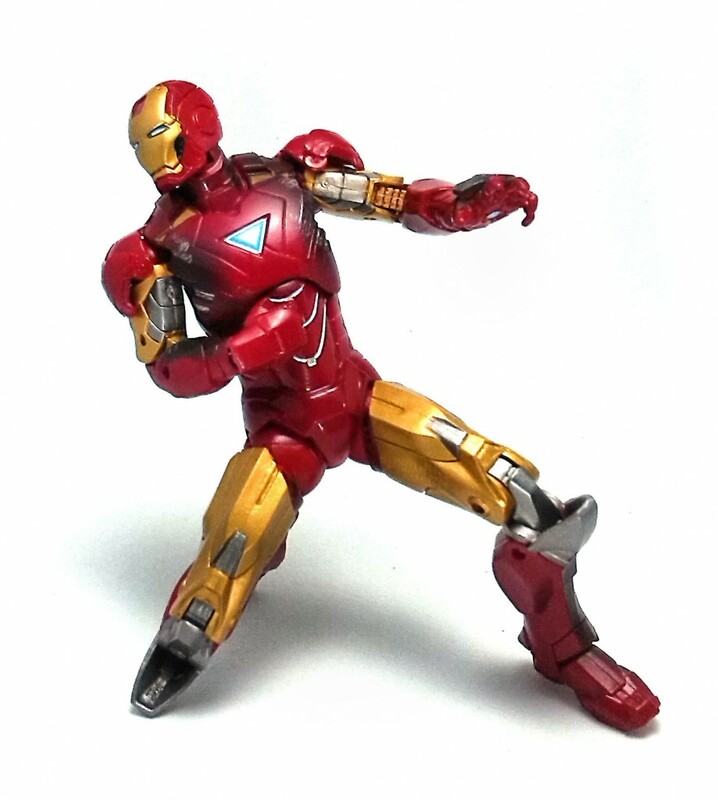 The overall look is quite effective, but the paint application is limited to the front of the figure, on the chest, right arm, left hand and left shin. The accessory count is where this Mark VI comes off a little short. 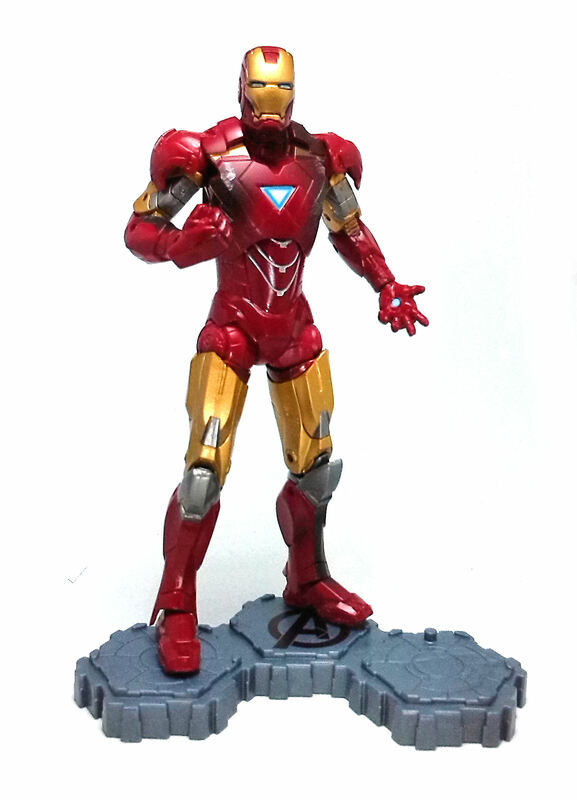 The IM2 release had a number of extra different hands, but this Avengers release only comes with the characteristic interlocking-hexagons plastic display base. 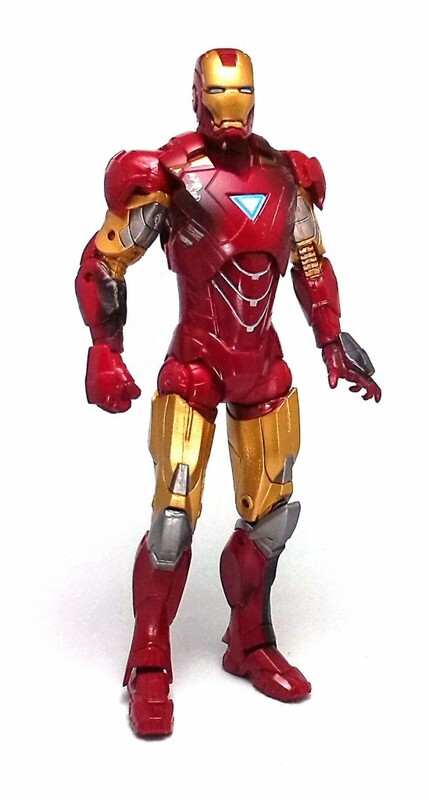 Overall, I like this version of the Iron Man armor, as the look is fairly unique and the articulation still holds up nicely next to the more recent movie-inspired Iron Man suits.